As we noted in an earlier report, excavations are a lot like peeling away the layers of a tall cake – where the newest layers are on top and the oldest on the bottom. You don’t know what is in the layer below until you actually get there. And getting there is a delicate and time-consuming process. In 2007 we visited Gournia, one of the best known archaeological sites on Crete – and a good example of the layer cake. 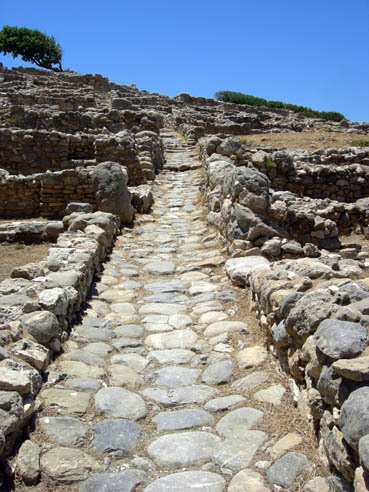 Harriet Boyd, a pioneering American archaeologist, excavated the center of this Minoan town in 1901 – 1904, revealing a system of cobbled streets, many houses and workshops, a small palace with courtyard, and a cemetery. 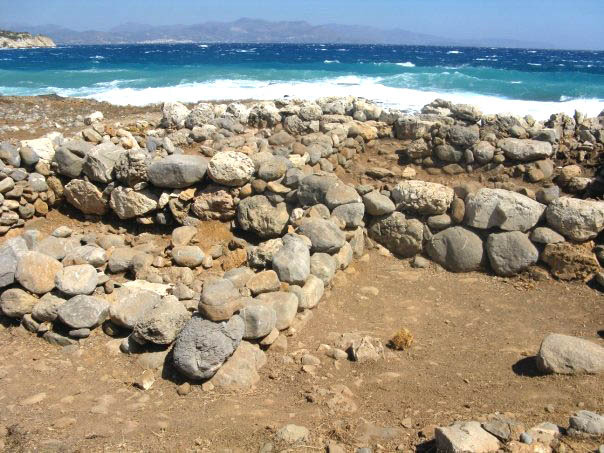 Of all sites in Crete, Gournia gives one the clearest idea of a town in the Late Minoan period (1700-1450 BCE). However, cemetery artifacts prove the town is much older. What might be found in the layers beneath this excavation? 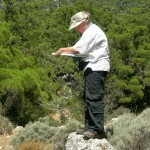 Last year we visited at Gournia with an American professor we know from a 2006 survey project. His small team was excavating a few trenches and sifting through the refuse pits left by Harriet Boyd over a hundred years ago. He also identified the remains of a ship shed on the beach, and stone fortification walls above the harbor. Bronze Age ship sheds are not uncommon, because wooden vessels had to be hauled out of the water for repairs and to dry out. 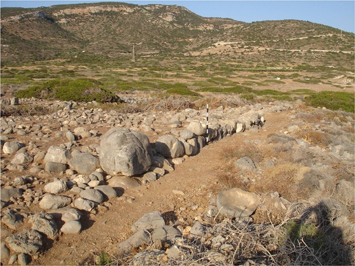 Fortifications, however, are unusual for Minoan Crete. 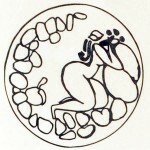 The discovery goes against the popular notion that Minoans were a peaceful society with no need for defensive structures. Clearly, even an untroubled country felt the need to protect itself. What they found was defensive walls designed to guard the most exposed approaches to the town – areas without natural sea cliffs. At one end of the harbor was heavy wall about 27 meters long, and the remains of a sturdy tower or bastion. On the opposite side of the harbor was another wall running parallel to the beach – to close off access from the sea. For added security, two inland walls were built to repel attackers from the sea. Unfortunately, when the Mycenaean Greeks invaded in about 1450 BCE, they came overland – not from the sea. 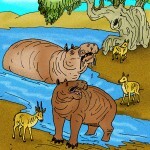 The project obtained a government permit to expand excavations for two more years. 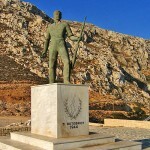 When we arrive at Gournia, the first thing we see is a man with surveying equipment near the top of the acropolis. We soon discover that fifty students and supervisors are divided into crews working at several locations around the town. We walk to the spot where a foundation wall was barely exposed last year in a shallow trench. Now there is a full-blown excavation of an ancient building. The archaeologist in change of this trench, is happy to discuss his progress. 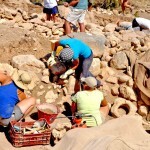 He says the dig has taken them from the Late Minoan level down to the Middle Minoan period, with some very interesting discoveries. He steps into the trench and points out a cut-away section where layers of history are labeled with small tags. These layers indicate what changes to the building were made by its occupants over the centuries. 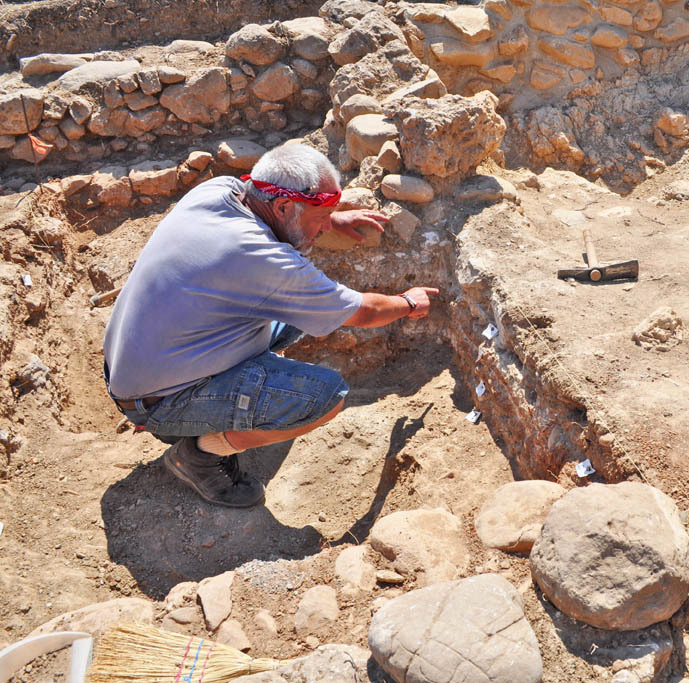 The most exciting artifacts his team found were ten “conical vessels” filled with pumice and ash from the volcanic eruption of Thera, which devastated the Minoan world around 1625 BCE. 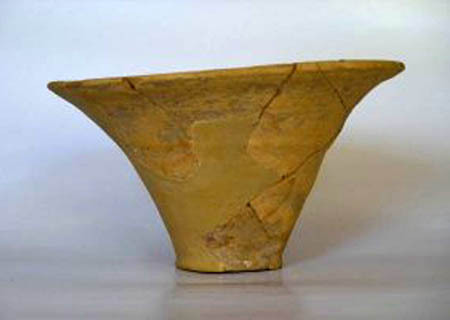 Similar ash-filled containers have been uncovered at other Minoan sites, usually near altars. Such vessels, ranging in size from cups to large jugs (rhytons), were used to pour ceremonial “libations” for the gods. Maybe these were votive offerings used when entreating the gods to avert another Thera-type disaster in the future. We hike to the top of the hill, where another team is excavating around the palace. We are following a stone paved lane on the southern side of the palace when we encounter a large boulder that seems to have been intentionally planted there. A nearby sign says this may be a sacred stone, which is a non-figurative representation of a deity. 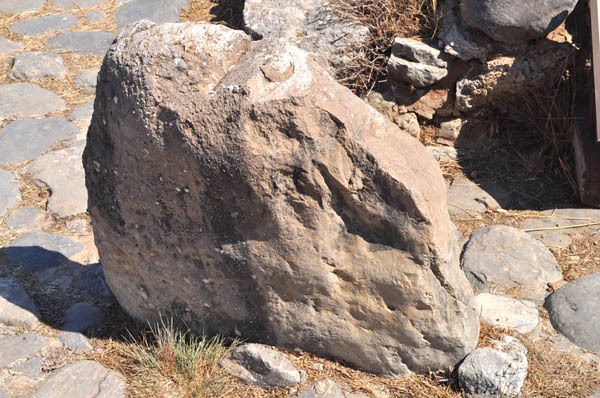 Minoan seals depict worshipers kneeling before such stones. As we pass by, Duane touches the boulder for luck. The trench supervisor for this area of excavations tells us his crew has recovered over a hundred conical vessels filled with Theran ash from a small room in the palace complex. If it is true that these were offerings to appease the gods, the fearful memory of the great volcanic disaster must have persisted for hundreds of years. To the south and southwest of the palace, trench teams are busily inching their way through layers of history using small spades and brushes to remove the earth, and carefully marking and removing each small artifact uncovered. The supervisors are busy with their notebooks, examining and recording the finds. The soil removed from each trench is heaped near a large sifting screen, and then shoveled onto the screen by a student whose job is to find any tiny pottery sherd or bone fragment overlooked by the diggers. All of the artifacts (categorized, bagged and labeled) are transported to the research center, which is several kilometers away from the Gournia site. 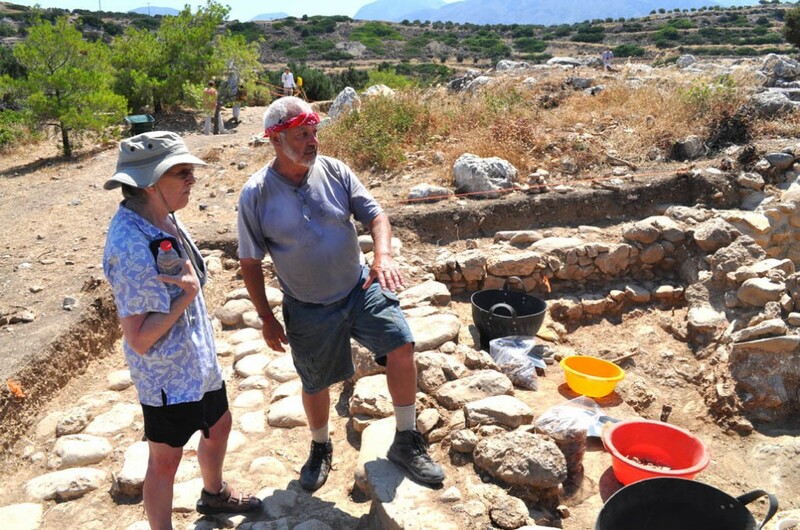 We drive there to connect with Sabine, an archaeologist we have known for several years. 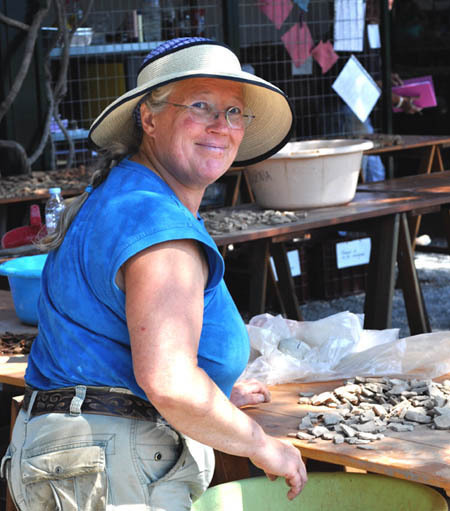 She is in charge of the cleaning crew – the people responsible for carefully removing the millennia of dirt encrusted on artifacts found at the excavation site. Sabine shows us how pottery sherds are soaked in a mild acid solution to dissolve the alkali crust that forms on buried objects. The pieces (still grouped according to where they were excavated), are then turned over to cleaners for the next step. The cleaners sit in the shade with water-filled plastic basins on their laps, using soft toothbrushes to carefully remove the dirt from artifacts. When the pieces are cleaned and rinsed, they are placed on large drying tables (according to coded excavation locations), and later categorized by experts. 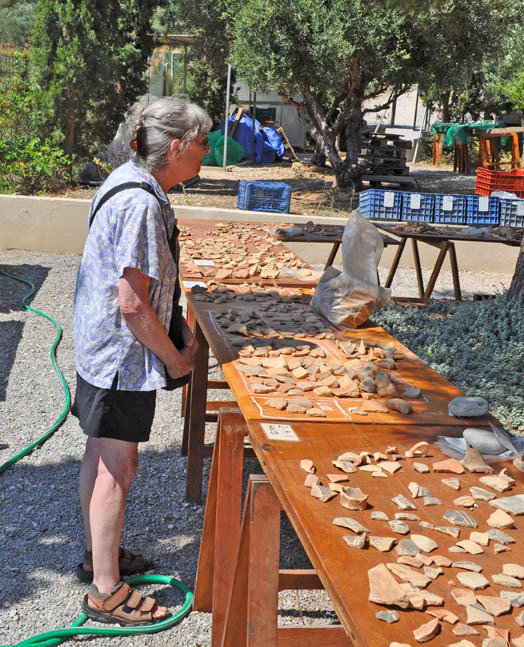 Sabine shows us a large array of pottery sherds, some with intricate designs of the Middle Minoan period. 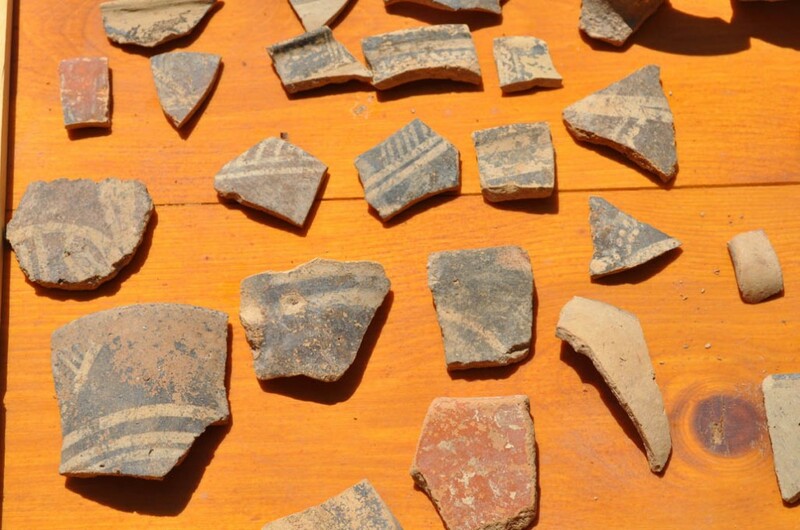 With many more finds to be uncovered, sorted, identified and analyzed, we are sure that the new Gournia excavations will reveal much more about the history and culture of this small town.